Calling it lightweight is an understatement. 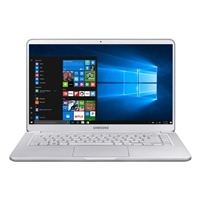 Weighing 1.8 pounds, the ready-to-travel Samsung Notebook 9 is packed with power. Get more done with the ultra-fast Intel Core i5 processor. Immerse yourself in the Full HD display. Use your USB-C cable to easily power up on the go. Or extend your battery life by 2 hours with just 20 minutes of fast charging.